Community: STAGING 101: Home Staging Made Easy. Name: Community: STAGING 101: Home Staging Made Easy. Decore & More presents: Staging 101 Home Staging Made Easy - Whether you are getting ready to sell your home or just want to rearrange the furniture in your home, we have the right tools for you! 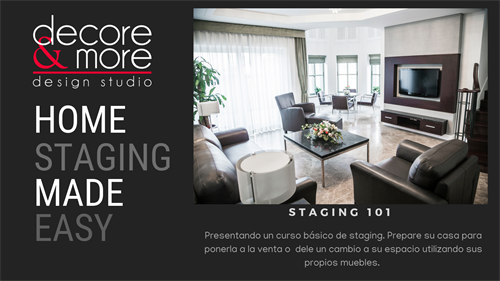 This course will show you the basic concepts of staging and its benefits. It will also help you learn some basic design concepts and will be full of decorating tips and trends. Gourmet coffee, finger food, and refreshments will be served. 9:00 AM to 12:45 PM.